near Concord village in the sun on the first day of September. The repose of that quite venerable town … was suddenly broken by the shrill note of the engine and a hundred passengers alighted from the train of freight cars laden with materials for the line. The route from Boston to Concord is most picturesque and pleasing, passing [among other locations] the clear waters of Walden Pond. The regular trains will now commence running to Concord, and the track is rapidly progressing towards Vermont, and Canada. A year later, Henry David Thoreau moved into the cabin he built near the pond’s shoreline. As noted in his book, Walden, he procured the boards for his abode from the “uncommonly fine” shanty of Irish railroad worker James Collins, who was moving up the line with the transportation project. The whistle of the locomotive penetrates my woods summer and winter, sounding like the scream of a hawk over a farmer’s yard, informing me that many restless city merchants are arriving within the circle of the town, or adventurous county traders from the other side. 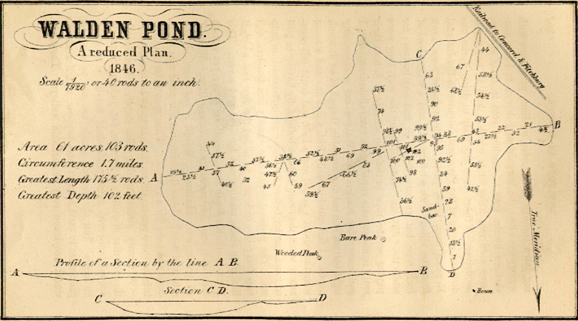 Thoreau’s 1846 survey of Walden Pond. Note the unfinished Fitchburg Railroad line at top right. His cabin was located about where the arrow’s fletching is at the middle right. I swam from A to B, and back. Each one is a man, an Irishman, or a Yankee man. The rails are laid on them and they are covered with sand, and cars run smooth over them. They are sound sleepers, I assure you. … And I am glad to know that it takes a gang of men for every five miles to keep the sleepers down and level in their beds as it is, for this is a sign that they may sometime get up again. Waves of unskilled Irish arrived in America during a “forgotten era” of immigration before the Great Famine of the late 1840s. They were cheap labor for the dirty and dangerous work of building the nation’s canals and railroads. A decade before the Fitchburg line was laid, 57 Irish railroad workers died of cholera–though some were probably murdered–at Duffy’s Cut, near Philadelphia, where they were buried in a notorious mass grave. Irish people are referenced throughout Walden. Thoreau described the “clumsy Irish laborers” who cut blocks of ice on the pond in winter, and “Poor John Field … born to be poor, with his inherited Irish poverty.” He wrote, “the culture of an Irishman is an enterprise to be undertaken with a sort of moral bog hoe.” Scholars have debated whether Thoreau was prejudice against the Irish. One University of Notre Dame professor blames such interpretations on “hasty reading” of the book. I am a confident, year-round pool swimmer, but I rarely get the chance to stroke through open water. Given Walden’s smooth surface and historical significance, this was an exhilarating opportunity. I entered from the sandy beach at the east end of the 65-acre oval. Aerial view of Walden, with commuter rail right-of-way at bottom right, which is west. 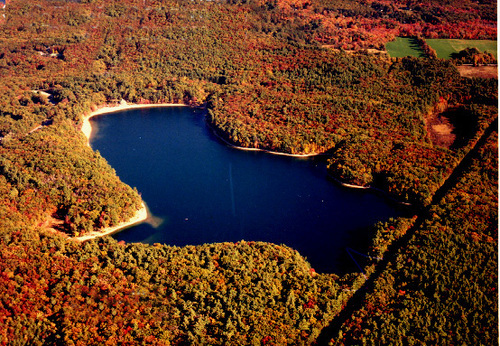 Photo: Walden Pond State Reservation. For the next 20 minutes, I alternated between freestyle and breast strokes, the former to cover the distance more quickly, the latter to make head up navigational adjustments. There are no lap lanes across Walden Pond. Then silence. Then water rippling around my ears. My breathing. I dropped my head and stretched forward my right arm to begin the final segment of freestyle to the shore. There, I rested a few moments. A raft for fishing? A raft for sledding blocks of pond ice? Or perhaps, looking eastward as I was, a raft for their imaginations to drift across Walden, across the Atlantic, all the way back to Ireland, even as their starving countrymen began sailing westward in the dark holds of equally dubious vessels. I waded into the shallow and plunged into the pond to begin the half-mile swim back to my wife and friends. Back to the 21st century. I am now another ghost of Walden; one who never built a railroad, a shanty, or even a simple raft. I am digging with my pen, as poet Seamus Heaney wrote; I am building my railroad on sleepers of words. “Forgotten era” is the section title for the immigration period 1700 to 1840, in Jay P. Dolan’s The Irish Americans: A History, Bloomsbury Press, New York, 2008. More than one million people left Ireland in the 30 years before the Famine (p. 35), and up to 60 percent were unskilled laborers (p. 37). Irish workers helped to build America’s canal system in the early 19th century, then shifted to railroad work as that mode of transportation became more practical and profitable to commercial interests. In both cases, migrant Irish laborers lived in shanty communities near the project sites (pgs. 42-46). This entry was posted in Arts & Culture, Business & Environment, History, Irish America, Journalism and tagged Great Famine, Henry David Thoreau, shanty Irish, Walden Pond on September 16, 2018 by admin.